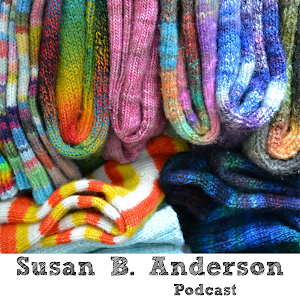 Susan B. Anderson: Win a Copy of the Unnofficial Harry Potter Knits 2013! 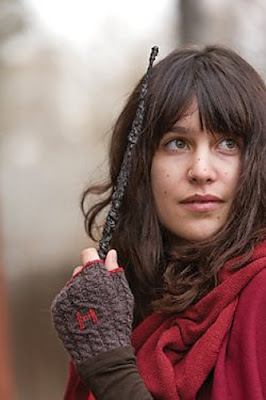 Win a Copy of the Unnofficial Harry Potter Knits 2013! 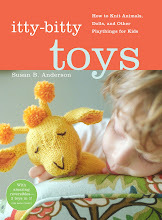 Edited to Add: Wendy Bernard of Knit and Tonic has reviewed and is hosting a giveaway for Topsy-Turvy Inside Knit Toys! I am such a fan of her writing and I had that doll she is talking about. Please hop over and give her some love. Click here to go to the Knit and Tonic review and giveaway! First, thank you for the support over on the My Mountain page. I made the semi-finals for a hat design and voting for the winner is currently going on. 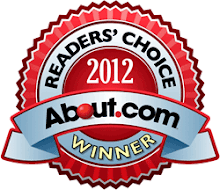 The My Mountain company wants and encourages us to keep spreading the word to get people over to the page to vote for the favorites. Now you are able to vote once per day. 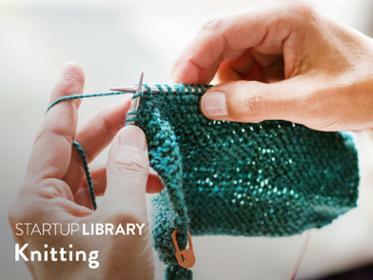 Please check it out (and daily if possible) and share with your knitting friends! Click here to visit the My Mountain Hat Design Contest voting page! Ginny's Cardigan (above) has a lace panel running down the back that looks like stacked owls, which I love, and then the rest of the cardi is in stockinette stitch. 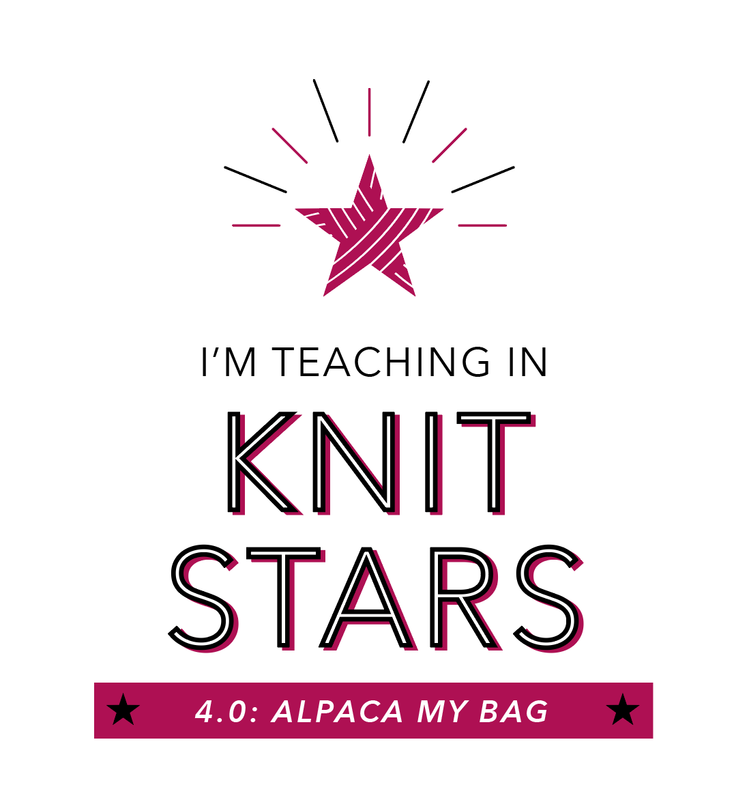 I have the yarn picked out and can't wait to dig into this fun design. I like this one and many other designs in this issue because they aren't all costume-y looking but rather inspired by Harry Potter. There are a couple of more costume-like designs thrown in just for fun. Click here to see all of the Unofficial Harry Potter projects in this issue! There are 32 designs. 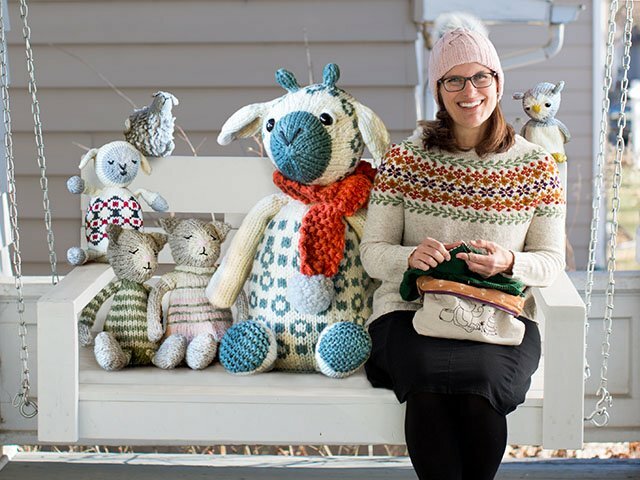 The following are a few more of my favorites from the issue and projects that will be going on my needles soon. There are sweaters for men and women, scarves, hats, shawls, mitts, vests, wraps, socks, mittens, gauntlets, a cape and more in the issue. Click here to purchase the issue or click here to look at all 32 projects. I am so excited to offer 5 of you the chance to win a copy of the Unofficial Harry Potter Knits 2013 magazine! Thank you to Interweave for the generous prize offering today! Please note that the winners must have a U.S. mailing address! Please leave one comment on this blog post to enter to win. 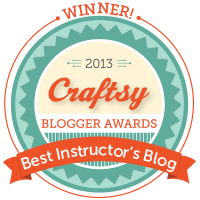 Please leave your Ravelry ID or an email address for me to get in contact with you if you win. Please be patient for your comment to appear on the blog and don't keep entering the same comment. I have to approve the comments due to spam so sometimes it takes awhile for your comment to appear. If you feel like it please tell me your favorite Harry Potter book or your favorite project in the magazine. It's not necessary but I'd love to hear your Harry Potter thoughts. I think you will love this magazine if you are a Harry Potter fan or not. There are loads of great projects for everyone. Wow, I might be one of the first comments. I love Harry Potter, and this magazine would be awesome! I think my favourite books are the 4th and 5th. When I was younger I was obsessed with everything Harry Potter. I would love to knit those socks...and I do love the mitts too! I would love to get my hands on the Harry Potter Knits, I can see a lot of good patterns in there! I remember resisting HP for a year or two but was given the first book as a gift. I never looked back after that. Great patterns in this magazine! Great patterns. My two favorite patterns would be the O.W.L. Mittens and Dragon's Egg Socks. Count me in. This book looks great! I would love to knit the O.W.L. mittens ... so cute! I love Harry Potter!!! I waited in line for the books when they came out! I loved them all, well, that isn't true. The second one, I wasn't a huge fan of. I LOVE the Ginny Cardigan. Thanks so much for the opportunity! See you in a couple weeks! This is such a great give away. I just love the mudblood cardigan! Ginnys cardigan and the heliopath vest are wonderful too. They're all going in my queue. I have a Harry Potter super-fan friend who would love those mittens for Christmas. The mudblood sweater is my favorite but there are several sweaters I like. I love the last book, but Goblet of Fire was my favorite. This book is so cool. Really well thought out designs, they all fit so well. I love the Hagrid Sweater and the Fred and George socks! I really like the Ignotus Peverell's Cloak and the Heliopath vest is another favorite. I love the patterms, too many good ones to choose a favourite. The HP books were a great read and I finally saw the last film recently which was really good - well I thought the final few minutes in the railway station were a bit weak. Oh my goodness, that lace panel cardigan might just be the thing to convince me to knit myself a sweater! How pretty! I love all the Harry Potter books and also adore the Narcissa socks. 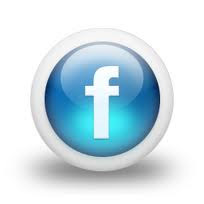 Find me as Fibergeek on Ravelery. I hope I win a copy. Wow! This is really cool! I love the Forbidden Forest scarf :) My favorite book is The Half Blood Prince. Oh my GOODNESS would I ever love to win this! I'm a teacher (crafts) at a role-play, Harry Potter-inspired summer camp... so to say I'm obsessed with all things HP is an understatement :) Ravelry name is thedaviszoo. Thanks so much for the chance, Susie!! What a fun magazine. THanks for the opportunity to win. 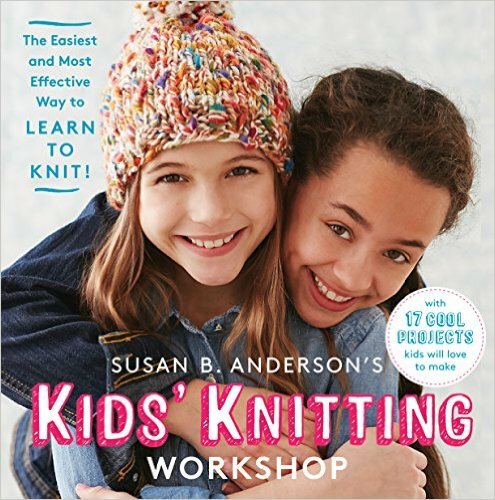 I agree that the sweater on the cover is a must knit! I'd love to win just for that design. Love, love, love! I absolutely LOVE HP. Grew up reading the books and now enjoy the films with my children (the first few for now). My Rav ID is Roobee. Thank you for the giveaway! What great patterns! They could be used for so many gift ideas! I've GOT to win this! My oldest niece is finally as into Harry Potter as I am, and I'm hoping to keep her enthusiastic about all things Potter (and reading!) by making her lots of HP-inspired goodies. She's already requested a new owl hat and Gryffindor scarf for Christmas! What a great giveaway! I am not sure but I think I really liked the first HP one. I know some folks in my family who would love for me to knit them HP stuff. Love the cardigan! This magazine looks amazing! I love all the Harry Potter books and my favorite pattern is definitely Tonk's Togs. Thanks! I need to win this! My oldest niece is finally as excited about Harry Potter as I've been for years - I've been waiting so long to share this with her. Hoping to keep her enthusiasm for all things Potter (and for reading, and being immersed in a book!) with lots of HP-themed goodies - she's already requested an owl hat and a Gryffindor scarf for Christmas. I LOVE these designs. I think my favourites are the Fred & George socks - so original! Pick me, pick me! I feel like a pumpkin in a pumpkin patch! Thanks so much for the chance at this wonderful prize. Even the cover is spectacular. My fav is Tracery.....just look at that stained glass effect detail. love the fingerless mitts....and there is a pair of socks that sort of caught my eye, too! thanks for the chance to win!! That looks amazing! My favorite book is Prisoner of Azkaban. Thanks for the giveaway - My Rav name is JennFM. Tonks' Togs oversweater for me! I have coveted this book for weeks and am THRILLED that you are offering a chance to own for FREE! I adore the Harry Potter series! The patterns here look amazing. Oh I love this issue. I want to make the wands too! Oh, I love so many of the patterns in this issue! I think my favorite may be the Gray Lady's Cloak, and I also think the E.L.F. cap is really fun and clever. Thanks for the giveaway! So many lovely patterns, I would love a copy of this magazine. Thanks for another awesome give-a-way. I love Ginny's cardigan! I have to get a copy of this one! Thanks for the giveaway! 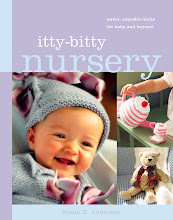 I would love to add this pattern book to my library, there are some cute patterns here. Would love to win the new magazine, can't decide on my favs though. Thanks for the great giveaway. I don't have a favorite...love them all and I think my daughter and I have watched the movies so many times we can lip sync them!! Thanks for the giveaway. Would love to have my own copy of the Unofficial Harry Potter Knits! A woman in my knitting group is currently making the scarf. Harry Potter is very popular in our house - My daughter just can't get enough. I love the detailing on ginny's cardigan! Would love to win! :) my rav id is neurasthenia. Ginny's cardigan is beautiful! What an awesome collection of patterns! I love Harry Potter! Thanks for offering this giveaway! I adore the Heliopath vest, gorgeous! Thank you for such a lovely offer! Thank you for the opportunity to with this great knitting book. I would have to start with socks for my nephew Cillian as he was the original Harry Potter fan in my family. Oh my! I've been eyeing this book. I love all things HP. I would love to win this! I love the mud blood Candi, but will probably make the socks. Love all the HP books ~ fond memories of my now 26 year old son sitting in a chair the day each book came out and reading from cover to cover! Oh boy, this got me so excited this morning! One of my favorites is when Harry, Hermione and the Wesley's are at the Quidditch World match in book 4. I have already made my whole family the Gryffindor scarves, this book would be a nice addition for our wardrobe. I love the socks, would love to win a copy of the Harry Potter Knits 2013. Thanks for the giveaway. What an AWESOME giveaway !!! I am giant Harry Potter Fan. Love it. The books are so great a must read for all. I would love to knit the sock from the book. Thanks for such a great giveaway ! I spent a year reading my son all seven books and became a fan. I even made tiny house stockings for our Christmas tree one year. Luna is one of our favourite characters. My favourite pattern is the Fred&George socks. Love that cardigan. Nice giveaway. Wow! 5 copies to giveaway. That's so generous of you and Interweave. Thank you. The magazine is loaded with amazing projects but if I had to choose a first one, I'd pick the elf cap. I'm feeling mischievous this morning. 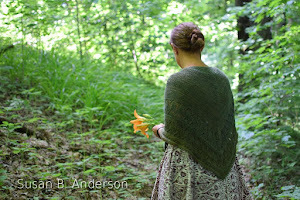 Would love seeing Mermaid shawl on MY needles. I love The Gray Lady's Cloak. Thanks for the great giveaway! I have yet to knit a sweater, but I may have to make the Owl sweater for my 15 year old Potter fanatic! I love the Mudblood cardigan. I have read all the books multiple times, and can't say that I have a favorite. There is no "favorite". I'm 65, a former university level professor of English and I still reread them all about every five years or so! Just wish I were better at knitting and reading at the same time! What a great giveaway - love HP! The magazine looks full of great patterns (I'd love to make the Hagrid sweater or Severus pullover for my husband), but I already have yarn that would be perfect for the Fred and George socks! 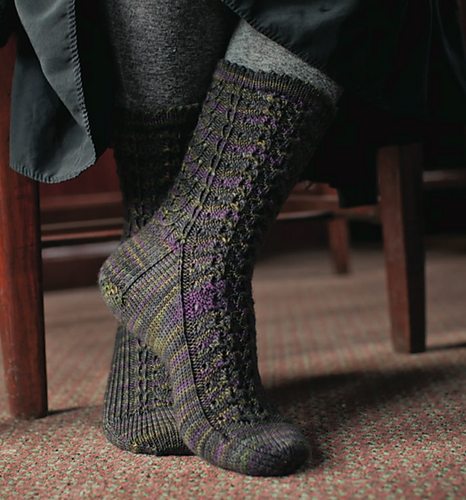 My favorite project is the Narcissa Socks. Thanks for the chance to win the book. Love owls and my kids love HP. This would be a fun new book to experiment with. I love the knits and I am also a huge Harry Potter fan. I love watching the movies with the kids. 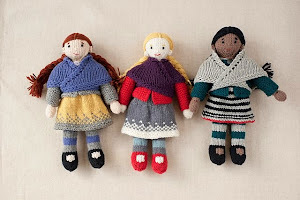 All the delicious knits make me yearn for winter all the time :) I am also a huge fan of your knits! I just wish I could knit faster so I could get more of them done before my kids grow up! Thanks for having the give away. The Ginny Sweater was the pattern that first caught my eye. Love all things owly. But also love the Heliopath vest and Mermaid shawl. Owls! Harry Potter! What's not to love. I remember buying the Deathly Hallows in Portland when it came out and had finished the last page as we pulled into the ferry terminal to our home near Vancouver (BC that is!). I was a terrible passenger. Ginny's Cardigan is my favorite, hands down! I'm a non-traditional HP fan-66 yrs old. I just re-read the whole set for the I-don't-know-how-manyth time. Love that sweater with the owls down the back. Looks like a great magazine with lots of great patterns. Would be fun to try some of them. I love Ginny's cardigan! So many cute whimsical patterns in this collection. The shawls are pretty as well! I love the HP books with Sirius. He is one of my favorite characters in the series. He is daring & loyal, and does what he thinks is right, even at personal cost. Looks awesome! I'd love to win one. My daughter is a huge Potter fan!! I would knit her something from this magazine for x-mas. Every. Time I look for it in the bookstore and the LYS it has been out of stock so I really need to win this. Thanks for the giveaway. I love that cardigan on the cover. Totally in love with the Heliopath Vest (Luna Lovegood! Yay!) -- I like how the styling even tried to match the look of the characters. My favorite HP book is probably Chamber of Secrets. Thank you for the chance to win. I've been thinking of buying this. Maureen715 on ravelry. Happy Fall everyone. I love Fall. I want to knit Ginny's cardigan! So cute. There are also pretty shawl designs in this collection. I hope this doesn't post twice - it said something about the field being blank when I tried to submit! I would love to win this book! 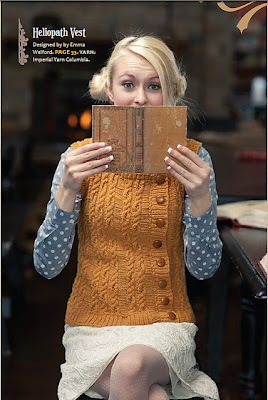 The vest pictured in this blog post is really nice and would be the first on my needles. I have been dying to get my hands on this! Lucky us! Thank you Susan! What a great give away! Thank you. I can see many gifts in there for the upcoming holidays and beyond. I love the cables and rich colors of the knitwear projects. I loved seeing these patterns when they were released! And I'm a huge fan of the books; I've read the series probably four or five times. Thanks for doing this giveaway. Would live a copy. Would love a copy. Thanks. Oh man, this book would be trouble in the sense that I would want make all the projects right away! Thanks for the opportunity! There are many projects that have caught my attention. I love Mermaids Song and Ginny's cardigan! And those socks! I'd love all of them. I love the patterns, and the photography really makes all the patterns shine! Truly beautiful and scene setting in the most amazing way! I love Ginny's Cardigan and the Order of the Phoenix Winged Vest - some really neat patterns in there. :) I really love all the books but I think the first is neat because of the wonder of everything new and exciting and different. SO many great patterns!! I powered through all of the Harry Potter books while snuggling my now almost 10 year old daughter as a newborn. I don't know if I can pick one favorite. Great contest! I remember bawling at the end of the last movie thinking "it can't be over!" It was such a great ride to read those books as they came out and to go the theater at christmas with my mum and aunt to see the next movie installment. Fun memories!! I love those socks!!! I was in El Salvador when the final book came out I had it pre-ordered and waiting for me at my house when I returned. And then I saw a Salvadoran teen reading a copy in Spanish in a restaurant and could not believe the reach of Harry. I want to knit Ginny's cardigan right along with you, Susan! It is so cute! Thanks for another fun giveaway! I actually bought the magazine already. But if I win I'll give it to one of my knitting girlfriends. I love the Heliopath Vest, but there are a lot of patterns in this magazine that I like. There are so many wonderful patterns in this book! 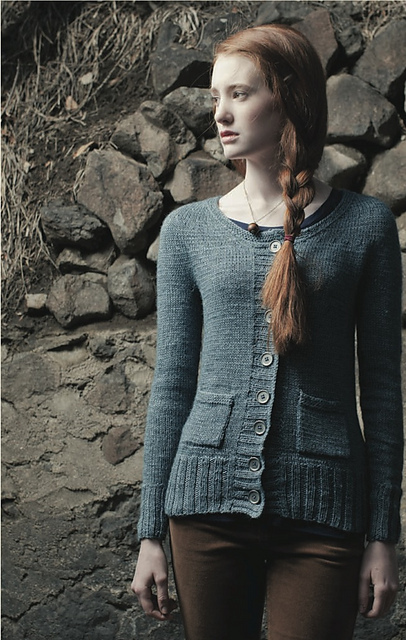 I know the Ginny's Cardigan is one of the most popular, and I have to agree, I really like it. My kids and I are currently re-watching all the movies. First, congrats on making the My Mountain finals! Second? I've been drooling over this magazine since it was released. I just haven't gotten my hands on it yet. Thanks for the chance to win. I'm elephantsknit over on Rav. I would love to win this magazine. There are so many great patterns. I love the cover sweater. I think some of the socks in HP issue are divine. I love the way the cardigan on cover buttons up, different and cute. I would love this! Thanks for making it available! Order of the Phoenix is my favorite. Just starting to get dark, but not too dark. I love most of the patterns in the magazine. My LYS sold out of copies immediately! I would love a copy. Thanks for doing this! Yeah! We love Harry Potter at our house! Every pattern looks so WEARABLE! Very excited. I love the cover cardigan too! I grew up with Harry Potter; they are single-handedly responsible for turning me into the voracious reader I am today. The patterns seem to capture the earthy magic that is so central to what makes Harry Potter Special. I shall be envious of everyone who wins. I love this issue too! I'd love to knit things from this! The socks are so cute. I love all the Harry Potter books and was excited when my 7 year old grandson told me he has finished book #3 this weekend. My grandchildren would love most any of the patterns. Please enter my name in the drawing. However, Harry Potter is probably my favorite thing in the world. It came to me during a very difficult time in my life and never went away. I have more Harry Potter stuff than any one person should. I can't pick just one book to be my favorite because they all have things I like and dislike about each of them. I do know that Prisoner of Azkaban was my least favorite of the movies (it felt too forced). I miss the Harry Potter hype a little. I'd love to knit an item or two and bring back the memories of the fun times reading the books going to the midnight release parties. HOW FUNNY! As the picture of the magazine came through two of my boys walked by and saw the words "Harry Potter." They immediately were excited and reading over my shoulders! The 14yr. old read the front of the magazine out loud while laughing! He enjoyed it! I would enjoy making the Narcissa Socks. And a few other of the projects! You are so sweet! HUGS! My favorite HP book is probably Prisoner of Azkaban or Order of the Phoenix. I'd love to win! It's true, I love Harry Potter maybe more than my 2 boys do...Just last weekend my boys were off camping with a group, so I snuck in some time to watch "Goblet of Fire" How funny is that? I love the cable designs in many of the patterns and am ready to start learning cables. Yay! I love LeStrange's cloak, may have to make it even if I don't win! Fave HP book - Book 3, the Prisoner of Azkaban!! I LOVE Harry Potter! I grew up with the books, and was the same age as the main characters as each volume came out. I loved the 3rd and 7th books especially, but they are all fantastic! Now that the last movie is out and there are no more Harry Potter things to look forward to, it's exciting to see this knitting magazine with patterns inspired by the characters! I love Ginny's cardigan, the Sword of Gryffindor mitts, and Hermione's Time Turner mitts! Ginny's cardigan is my favorite. Great giveaway! Thanks! Would love to win this book. I love all the Harry Potter books. Very ute patterns. I love the socks! My daughter bought the first book before it became popular! 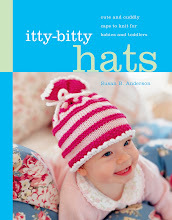 She has since learned to knit, and I'd love to give her this copy if I win. I also love the sweater from the cover. Thanks for the opportunity to win a copy. Wow! I'm itchy to get my hands on this, so thanks for the chance to win a copy! I love it when designers are inspired by popular culture! These patterns are so pretty. You have the best give always! Oops, forgot to indicate that my Rav name is Camanoah . Sorry! Hi Susan! Thanks for hosting another great giveaway. I adore Harry Potter-my favorite books being the 3rd and 5th and my favorite movies are the final two. 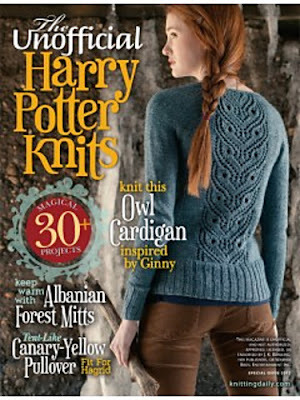 As for the patterns in this fabulous book, I would love to make Ginny's cardigan my first ever. I also could see Hermione's gloves on my needles, no question! i found harry potter at a local book store before anyone had heard of it! The O.W.L. Mittens are just great! And, a pair of mittens with a Harry Potter motif would just send my great nephew over the moon. The Winters in Stockholm, which is where my little relative and his parents live, are long and cold, and warm mittens are a must. Every Christmas for the past couple of year I have made mittens and mailed. Stranded knitting fits the bill. Thanks for the giveaway! I would love to knit Ginny's cardigan. 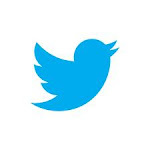 My favorites are the same as yours. I plan to knit Luna's vest for my daughter. I also like the Ginny cardigan on the cover. yarngirl32 says:i knitted a Harry Potter sweater for my grandson 10 yrs ago when he was 12 and we went on a Harry Potter tour to England. This book looks awesome! This collection looks awesome! I'm a huge Harry Potter fan, and this magazine is right up my alley. My favorite project is Tonk's Togs. I love cabled tunics. Although the other designs aren't bad, either! Still a big Potter fan! The books were a great bonding experience with my son. These patterns look great. I've been eyeing this magazine for a while now. So many beautiful patterns! My favorite book is The Goblet of Fire. My ravelry ID is khuckreimer. I love the Narcissa Socks, but also love Ginny's Sweater. The books are all so good. I've read them over and over again. Great giveaway. Thank you for the opportunity. 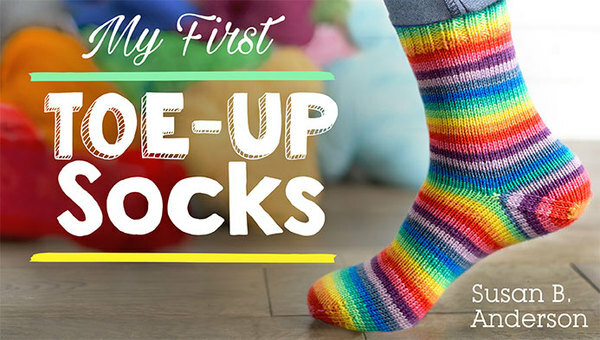 There are so many great patterns in that book, but I love the socks! 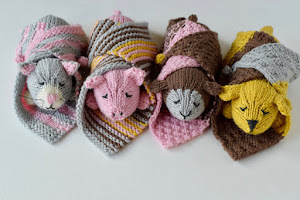 They would be great fun to knit while watching the movies! I rarely find one issue or book that has so many projects that I like. I like most of the patterns. I especially like the offset look of the Heliopath vest. The pattern on the front cover caught my eye right away! I really like the Heliopath vest, too. Thanks for the giveaway. I love Harry Potter! Harry Potter made learn enough English to read a book in English, and I'm doing it ever since. Really, I wasn't able before, only with a dictionary looking up around 40 words per page, so my English started to improve with a lot of magical vocabulary! I then lived a couple of months in London and commuted via Kings Cross every day. This so makes me think of all this. Of course I LOVE Severus and would knit his pullover for my hubby! Ginny's cardigan is definitely on my "to do" list. Another great giveaway! I've been a Harry Potter fan since my aunt gave me the first book when I was 11 (and it was first published in the US)! It's been a while since I've read the books, and lately I've thought about re-reading them. I think I liked the Half Blood Prince best.